Mandrakia is on the Southern side of the Ermioni peninsula. It is a place where one can just sit in a cafe or bar, listen to music, or watch the world go by. In the tavernas one can enjoy fresh fish, squid or octopus, served with a glass of local wine or the traditional ouzo, or if you want something more authentic, then try the local tzipouro. As most of the shops and business amenities are situated on the Limani side of Ermioni, it means that Mandrakia is the place to go if you want a larger selection of tavernas, cafes, bars and clubs. Mandrakia is the liveliest part of Ermioni, as depending on the season, its nightlife goes on until the early hours of the morning for the young-at-heart. Up until the early years of this Century, Mandrakia used to be the secondary port of Ermioni, with large ferries bringing visitors from Pireaus, docking at the jetty shown in the picture on the left, then continuing to Spetses, Porto Heli and finally Nafplio. However, following a strict review of health and safety on all passenger sea travel, many of the drop-front ferries were withdrawn from service throughout Greece. The flying dolphins and flying cats continue to service Ermioni, with the arrival and departure point now being at the Limani port only, however, there are no longer any sailings to Nafplio. Today, many yacht flotillas visit and moor up along the Mandrakia harbour waterfront during the very busy summer months. Local fishing boats still contine to use the Mandrakia harbour, as well as amateur fishermen of all ages, trying their luck. Many local people still take their traditional evening stroll (volta) along the Mandrakia waterfront, before deciding where to dine. Mandraki is the Greek description for 'low walls', given to the small stone harbours that were visible along the original waterfront, before the new road and paved walkway was constructed. Only three original Mandraki harbours remain, next to each other, on the far Western side of the coastline. All of these harbours have now been repaired/renovated/modernised by the night club opposite, for the comfort and safety of their patrons. Mandrakia was the traditional boat building side of Ermioni, sadly only one boat builder remains today, in addition to being the home of the many fishermen and their boats during the 18th to mid 20th Century. Today, some fishermen still use the Mandrakia waterfront to moor their traditional fishing boats, clean and unload their catch and mend their nets along the waterfront. 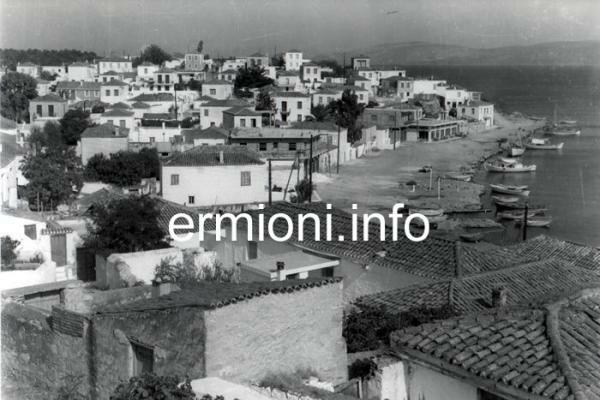 However, it shows how much Ermioni used to rely on the sea for its survival and development. At Mandrakia's Western end, you can walk along the road that climbs to the ancient Hill of Pronos. This is where the original town of Ancient Hermione was located, with a commercial harbour in the Kapari Bay below. Today, children and adults alike, fly their kites from this hill on 'Clean Monday', where traditional music and dancing takes place. At the top of the Hill of Pronos is the small church of Aghia Ermioni (pictured left) built in 1754, on the foundations of an ancient temple to the goddess Hera. This hilltop position commands fantastic views of Mandrakia, Limani and the Bisti peninsula, as well as the islands of Dokos and Hydra beyond Kapari Bay.